The Duchess of Cornwall was left licking her fingers in approval on Friday when she joined a group of young cooks, some from a Northamptonshire school, to make canapés for the Queen. Camilla could not resist sampling some of the royal mint icing that had stuck to her hand as she added a chocolate button to a miniature pudding created by the children, some of whom attend Latimer Arts College in Barton Seagrave. But she found herself gently scolded by royal pastry chef Kathryn Boyden, supervising the youngsters in Buckingham Palace's kitchens, who said "we're not supposed to do that". 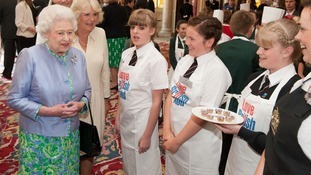 The sweet treat called royal mint princess' pudding - a tiny chocolate cake covered in mint icing - was one of many dishes created by four schools who had won the Cook for the Queen competition. Camilla came up with the idea of setting UK school children the challenge of creating a menu fit for the monarch to mark her Diamond Jubilee. Four winning schools were picked from more than 200 entrants and were invited to the palace on Friday to help royal chef Mark Flanagan and his team add the finishing touches to sumptuous canapés. The winning schools were Latimer Arts College, Eastington Primary School in Gloucestershire and Cape Cornwall School in Cornwall along with St Columba's Primary School in Oban, Scotland. The Queen sampled some of the dishes privately at lunchtime and then met pupils and staff at a reception where the canapés were served to the guests who included TV chefs Jamie Oliver and Rick Stein, and Camilla's son and food writer Tom Parker Bowles. The bite-sized snacks served included mackerel pate on Scottish porridge oatcakes, lavender shortbread with cream and blae'berries, salmon fishcakes and mini Cornish pasties filled with crab, saffron and leek. In a speech at the palace the Duchess highlighted the importance of cooking and said: "I care passionately about good food and believe that teaching young people to cook, to understand ingredients and where they come from, should be an essential part of the school experience." Pupils at a school in Northamptonshire are off to Buckingham Palace after winning a competition to cook lunch for the Queen. Video highlights of the Queen's visit to Stevenage.